A New Commitment...A New Crown. Crown Unlimited Machine was originally established in 1978 as a world-wide supplier to the Air Conditioning, Heating and Tube Fabricating Industries. We are continuing that tradition into the 21st century with an intensified commitment to Innovation and Reliability. Crown manufactures equipment used for the general fabrication of tubing and tubular assemblies, which includes decoiling, straightening, cutting, endforming and bending. New to Crown is the complete range of Patriot CNC rotary draw benders. We also build equipment for specific applications in the production of micro-multivoid and round-tube heat exchangers, including micro-multivoid decoiling, straightening and cutting, automatic micro-multivoid core assembly, serpentine bending systems and ancillary equipment. 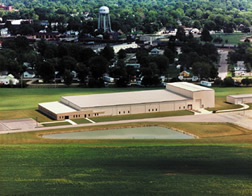 Crowns products are machined, fabricated, assembled and performance tested in our modern 57,000 square foot facility in Bluffton, Indiana U.S.A. Our in-house engineering team designs and develops both the mechanical and electrical systems. Our products are shipped and serviced world-wide by Crowns in-house technical staff. Nobody else can offer you better quality at lower prices. See for yourself: Ask us for a quote today. Our long-held company Philosophy is simple: Always put the customer first. We take no shortcuts meeting this goal. Extend your visit with us awhile. See Whats New, or read our Philosophy for a better understanding of why weve been successfully serving you and your friends or competitors for over twenty years. Were not new, but our industry-shaping ideas and innovations are.